Green tea is regarded as the amazing natural drink because of it's numerous health benefits. People around the world are choosing green tea to optimize their health. But is green tea really good ? Read the facts about green tea. What is Green Tea & How is it made ? Green tea is made from leaves of plant called Camellia sinensis. Usually the black tea leaves are fermented but green tea leaves are not, which is why they have more natural benefits. The history of green tea is associated with China and other Asian countries, it is also used as medicine in the ancient times. Green tea is associated with number of health benefits. Many researches done on green tea found evidences on it's credibility for curing or preventing many diseases. 1. Green tea increases mental health. 2. Green tea consumption can reduce risk of cancers according to studies. Drinking 3 cups of green tea daily can significantly reduce ovarian cancer, pancreatic cancer, breast cancer, prostate cancer and many other type of cancers. 3. Green tea helps in weight loss. The studies have shown that green tea promotes fat oxidation which contributes in reducing weight and abdominal fat. 4. Green tea helps in preventing neurological diseases like Parkinson’s and Alzheimer’s. A polyphenol called EGCG improves functionality of nerve cells. 5. Drinking green tea helps increase oral hygiene thus reducing the risk of any oral diseases. It's properties can also prevent risk of mouth cancers. 6. Green tea helps improve heart health. EGCG in green tea lowers the risk of inflammation and narrowing of blood vessels and also high level of LDL which significantly helps in having a good heart health. It's properties prevent blood clots which is a good sign for heart. 7. Green tea can help in anti ageing. The rich amounts of oligomeric proanthocyanidins - OPC an antioxidant in green tea slow downs the process of ageing making you look young and smart. 8. Green tea keeps high blood pressure in control. Excess of anything is not good. A normal adult without any extreme health conditions is advised not more than 5 cups of green tea in a day. 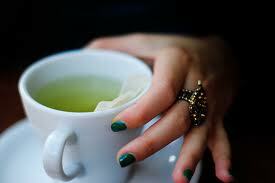 Overdose of green tea can cause sleep disorders, upset stomach and some other health issues.